Located on Church Street in the 11 story, Art Deco Warner Building. 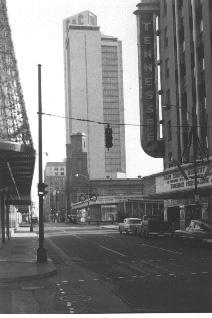 Both the theater and Warner Building were razed in the late 1980’s to make way for a new highrise. 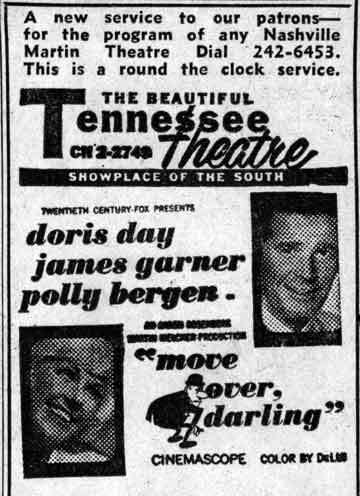 It was Nashville’s last grand old theatre. The total seating was 2028. Of those 2028, 278 were in the loge section for smoking. On opening the screen measured 30 x 22 feet. The orchestra pit could accomadate 25 musicians. The stage measured 26 feet deep and had a height of 66 feet. The Proscenium opening measured 43 feet by 29 feet. Crescent Amusement operated the Tennesse until 1960 when Martin took over and it became their flagship until it closed in 1978.